With over 99 national parks, 40 tiger reserves and 450 wildlife sanctuaries, India has spoiled fascinating species of flora and fauna. Every nook and cranny India’s rich fauna encompasses whether the Uttarakhand mountains or the deserts of Rajasthan. Mentioned below are 6 amazing wild life safaris of India. The Jim Corbett National Park is part of the larger Corbett Tiger Reserve. This park is first to come under the Project Tiger initiative. The magical landscape of Corbett is very well known and prominent for its tiger wealth. It is founded as Hailey National Park in 1936. This national park has the fame of being the oldest and the most prestigious national park of India. The Project was built in 1973 and extends over 520 square kilometers; the entire area consists of hills, marshy areas, river belts, meadows and large lakes. This national park has a good population of tigers and rare species such as crocodile and other, this national park is one of the most popular destinations for wildlife lovers. Dhikala, with the widespread Patil Dun Valley, is one of the most renowned destinations in Jim Corbett as it has an excellent site and the great abundance of wildlife. There are over 70,000 visitors come to visit this park every season. Forest has covered 73% of the national park. Grassland has covered 10% of the part. It has approximate 110 different tree species, 50 different species of mammals, 25 reptile species and 580 beautiful birds’ species. Periyar National Park is probably one of the most reserves in India. It is the best place for wildlife tourism in the country. It stretched over the 925 km2 of the area; the park has scenic charm and rich biodiversity. It is also among the 27 tiger reserves that have India. The park is a repository of rare flora, endemic and in danger of extinction and fauna and forms the main basin of two important rivers of Kerala, Periyar, and Pamba. Elephants are the main attractions of Periyar. However, Wild Pigs, Barking Deer, Dole, Gaur, Sambar, Tigers and Indian Wild Dogs are other animals that consider this place as their home. In Periyar, the rarely found Lion Tail Monkey, the NilgiriLangur, Common Langur and Capo Macaque can also be found; it is also the shelter of NilgiriTahr, which is rarely seen. Periyar has such a rich birdlife, darts, cormorants, Kingfisher, the great Malabar Hornbill and Drongos tail racquet are some of the most common species here. Here, visitors can hike in the sanctuary and thus get a beter chance to witness close-up wildlife. Kanha National Park was established in 1955, in Madhya Pradesh state. The national park extends along about 940 km², to which are added another 1000 km² as a buffer zone. It rises to about 600 - 900 m above the sea level. Kanha has a large population of leopards. It has the excellent health of the 22 species of mammals. Kanha National Park shows that this is one of the best preserved national parks in Asia. 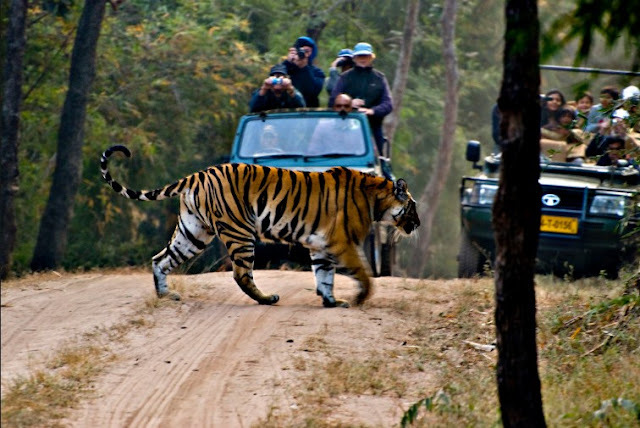 No other national park offers as much variety in Tiger sighting modes as Kanha. In addition, it has an important population of leopards, wild dogs and lazy bears with 175 species of birds. There is a long history behind the formation of Bandhavgarh. This national park has covered 437 Km2. It is located in the middle part of the Vindhya Hills. This park has a high density of wildlife and wide variety of habitats that make this national park more popular. It has many tigers and it is also called a land of white tigers. Before the formation of the national park, this place was called as Shikargarh or it was also famous as the hunting ground of the Maharaja of Rewa. In this place, the Maharaja and his guests used to hunt many species. Bandhavgarh is the paradise of many birds such as White-browed tails, Pompadour Pigeons green, White and Black Malabar hornbills which are rare to see, macaws, emerald bee-eaters, owls, Minivets, Charming Flycatchers, Steppe Eagles, Gray Malabar Stumps, Pink-faced parrots, Bluebeard beetles, White-bellied Drongs, Whites Golden Front and Common Wood Shrikes. Bandipur National Park is in the Chamarajanagar District, Karnataka and it is one of the beautiful national parks in India. It is located in the western ghats of the Mysore. It has covered approximately 874 km2. This national park is also known as “Nilgiri Biosphere Reserve” as it creates the largest biosphere reserve in India. This national park plays a major role in India’s efforts for the protection of the Echo, so it is one of the best wildlife safari destinations in South India. Bandipur National Park has a significant number of tigers and it has other several wildlife species also such as Sambhar, Mouse Deer, Wild Dogs, Lazy Bear, Malabar Squirrel, Black Knapped Hare, Gaur (One type of Bull), Chital, Four-horned antelope, Wild Boars, Panther, Lazy Bear, and Porcupines. Various different types of beautiful birds such as Green Dove also found here. Kaziranga is in the Nagaon and Golaghar districts of the state of Assam. Kaziranga National Park has one of the most exotic animals. This national park is the home of one horned rhinoceros. The total population of rhinos is 2,401, out of which 1,651 adult rhinos (663 male, 802 are females, 186 unsexed); 294 sub-adults (90 males, 114 females, 90 unsexed); 251 juveniles and 205 cubs. Kaziranga has covered over 430 Km2 of the area. Where this park is located, is very far from the human inhabitants and because of this reason, wild life blooms widely and wonderfully here. Kaziranga has included rhinos, bears, numerous pretty birds, elephants, and Panthers. Kaziranga National Park is one of the most popular UNESCO World Heritage Sites. Kaziranga has the highest density of Tigers and has large breeding populations of elephants.